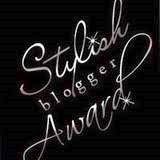 Well I must be doing something right lately, because Mara and Tracy passed the Stylish blogger award onto lil ole me! 1) I have read every Nicholas Sparks' book to date. 3) I have a Dwight bobble head on my desk. His head is moving as I type this. 5) Last week I threw out a Gladware container of something in my freezer that I a) had no idea how long it'd been in there and b) had no clue what it was. I was scared. 6) My suitcase from staying in NC this summer is still in the laundry room, largely unpacked. 7) Everyday I unlock the front door and peak outside to see if I have a package. Even if I'm not expecting anything, I have to do it. Phew, I think that's 15! Woot! Thanks for the award! Much appreciated. =) I guess I know what I'll be doing on this beautiful Saturday. Thanks for tagging me! I do the peeking for a package thing too! How funny. Thanks for tagging me on this award:) So very nice! OMG...so jealous that you have a Dwight bobblehead!!!! I'm really excited that you tagged me and I'm looking forward to doing a post and passing the award on! I love that you have to check and see if there is a package there! So sorry April! It's fixed now!